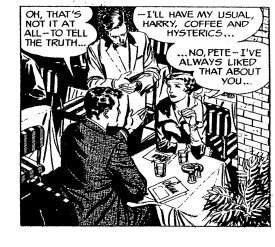 An immaculately composed sequence from Mary Perkins on Stage; This sample and those below ©2006 Tribune Media Services Inc.
A few months back, I stumbled across a website containing scans from classic newspaper continuity strips and began browsing through its contents. One strip in particular caught my eye: Mary Perkins on Stage, a melodrama following the trials and tribulations of an aspiring young actress as she leaves her pastoral hometown and struggles to make it in the big-city theater world. The art was gorgeous, the dialogue crackled and the story was a tad more adult than what I was used to seeing in classic comic strips. Needless to say, I was intrigued. As luck would have it, a few weeks later I learned that strip-repackaging publisher Classic Comics Press was bringing the strip back into print. Without a moment's hesitation, I visited their website and ordered a copy of the first volume. I'm very glad I did. Par for the course in daily continuities, intrigue swirls about Mary almost from the moment she steps foot off the train in New York City. She's quickly taken under the dubious wing of Gordon D'Avilla, a con artist turned theatrical agent who sets budding young starlets like Mary up with expensive makeovers and acting lessons then abandons them once their money has run out. Mary survives the experience through pluck and good fortune, but finds herself needing a dayjob to replace the lost money. This leads Mary to a job as a cigarette girl at the Pink Cherub, a moody, smoke-filled jazz club run by an aging jazz singer named Flora, who takes Mary under her wing and teaches her the ins and outs of life in the big city. Flora is tough and cynical, but an almost motherly concern for her young employee/protégé quickly becomes the prism through which her inner nature shines. 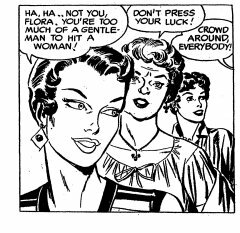 Early on, creator Leonard Starr also drops several semi-subtle hints that Flora is something of a dyke — after the club's piano player fails to stop a masher from trying to manhandle Mary, Flora steps in and thrashes him with her meaty fists. Shortly thereafter, Flora notes that the piano player seems to have his eye on the budding young actress, causing him to note, "Mmmm... your eyes check out 20/20." "Can't really blame you --" Flora replies, "I've been doing a lot of thinking about her myself..." I suspect an editor must have quashed this potential complication in fairly short order, as such references disappear from the strip a few weeks later. In any case, the notion is never played for sleaze value, and Flora's attentions towards Mary never waver from the strictly platonic care and concern of a doting aunt. For the 1950s, it's a surprisingly knowing and nuanced portrayal of a gay character, even if it ultimately never goes anywhere. This is an immaculately drawn strip. I found myself lingering over the stunning compositions on every page, with perfectly poised figures, gestures and facial expressions that always hit their mark just so, clothing folded and draped with stunning accuracy, photorealistic backgrounds and an astute framing of narrative sequences. Aspiring cartoonists would almost certainly benefit from studying Leonard Starr's work in Mary Perkins on Stage; fans of comic art will want this book just to drink in a near-perfect example of the form. What really sets Mary Perkins above other continuity strips, however, is the storytelling. The plots are believable, despite containing more than a touch of melodrama. You can believe that the trials and tribulations that our plucky young heroine endures in her quest for fame are, if not common to young actresses, at least possible for someone presented as having her latent talent. 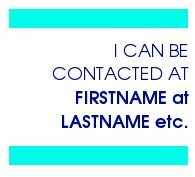 Mary dodges around sharks, scheming ingenues, cattle-call auditions and the dreaded casting couch with the poise and naivete of someone raised on small-town values, yet learns quickly enough to navigate her way around people far more sophisticated than herself. And Starr has a solid handle on said sophisticates, as well — the denizens of the theater world seem perfectly composed, showing a range of personalities that feel fleshed out despite conforming to many of the stereotypes one would expect to discover in such a setting. The dialogue is note perfect; one antagonist of Mary's in particular, a TV actress named Gaye Brittle, could easily have stepped off the set of Howard Hawks' His Girl Friday with her clever one-liners and ingenue's ability to manipulate the people around her. Despite the copious melodrama, there's a very adult sensibility to this strip that makes for a surprisingly sophisticated reading experience. Further, Leonard Starr is especially adept at keeping readers involved in a daily storyline without doubling back upon himself to keep everyone up to date. I don't think I saw a single repeated panel, let alone a recap of the story so far. Unlike many such strips, Mary Perkins on Stage flows smoothly from strip to strip and from page to page, even when gathered in a collection like this. It reads more like the first volume of a graphic-novel series than it does a year's worth of newspaper strips. This may well be my favorite comic-strip discovery of 2006 to date. The next volume is slated for release in November; I suspect I'll be among the first to order a copy.